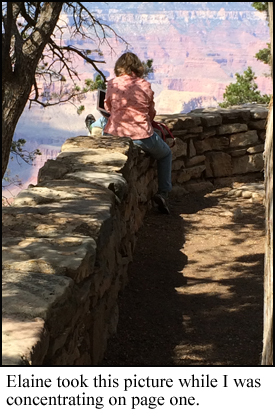 It may seem odd to start a book sitting on a wall overlooking the Grand Canyon, but that’s just what I did. On our ten-day sisters’ road trip, Elaine and I hit 8 national parks, starting with the Petrified Forest and ending with the Great Sand Dunes. On our second day at the Grand Canyon, after we had taken the early morning bus tour along the ridge and hopped off several places, we split up to go our separate ways until dinnertime. Elaine sat on the porch swing and read a book, glancing up from time to time to watch how the canyon colors changed with the angle of the sun. I found an out-of-the way spot on a wall and opened my laptop. I’d brought some pages of research for my annual Christmas novella that goes up each fall as an e-book. I’d been thinking about the plot for several weeks, and Elaine and I had talked it through on the road and named the characters. I have only been to the Grand Canyon in May and August, never in the winter, so I didn’t think of setting a Christmas novella there, although I learned the canyon is open year-round. The Cowboy’s Christmas Getaway takes place on a cruise ship heading to Hawaii. I’ve never been to Hawaii, but I have been on a cruise ship, so I set the book in a location I had experienced. Still, I was in the Grand Canyon taking a break from walking. So I worked in an earlier vacation for Deputy U.S. Marshal Jesse Baylor. My perch overlooked a flat rock outcropping about 30 feet below, and I let Jesse sit there for a few minutes every day for the three days he was in the national park. He thought of the eons it took to form the canyon, of the silence, of the huge raven circling close by. I thought of those things, too. But I also concentrated on my story. I pulled up a fresh new blank document and started writing. 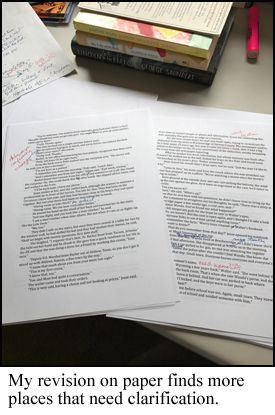 My e-book novellas run around 30,000 words (120 pages). They take place in a short amount of time, usually a week or less. 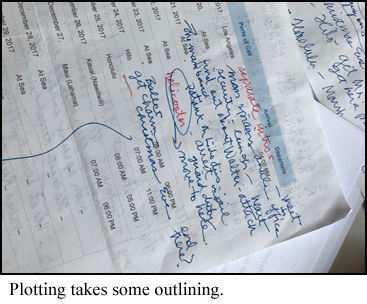 For this one, I ended it on day six of the cruise, and I plotted it using an actual cruise schedule. For Dr. Rachel Reed’s part, I researched doctors onboard and read several memoirs from cruise docs on things that happened to them while being in charge health-wise of a floating city. After our road trip (we also saw the Painted Desert, Zion, Bryce, Arches, and Mesa Verde), I set a goal of 1,000 words a day, then upped it to 1,500 words. I made sure I got those words in every day until the story was told. I revised online and then on paper, amazed that I had missed so many problem areas. I had two beta readers (Marshall and Abby) looking for holes in the story or places where the reader could get confused. Morgan came up with the cover. Beginning a story in the Grand Canyon was inspiring for me, but feeling the spirits of the ancient ones in Mesa Verde always touches me. I may just set next year’s Christmas novella there.